It was a very noisy night spent in the parking lot at Isle of Capri Casino last night between the highway bridge noises and the trains going by. Neither of us slept well. So we’re tired today and only drove 125 miles. Today we’ve been seeing the rice fields. This is the area where we saw them when we were riding the Amtrak train earlier. 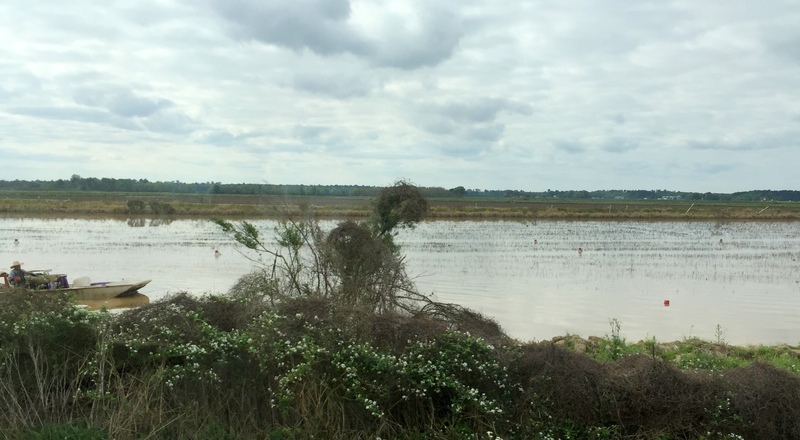 Besides rice going in the flooded fields there are cages to capture the crawfish they grow there too. Double duty. 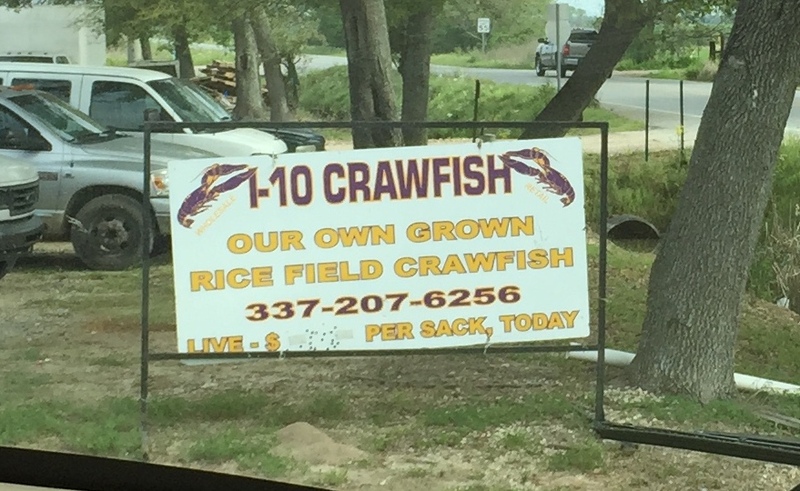 You can buy sacks of live crawfish. We’re not planning to have a big crawfish boil party any time soon, but if we were now we know where to get them. 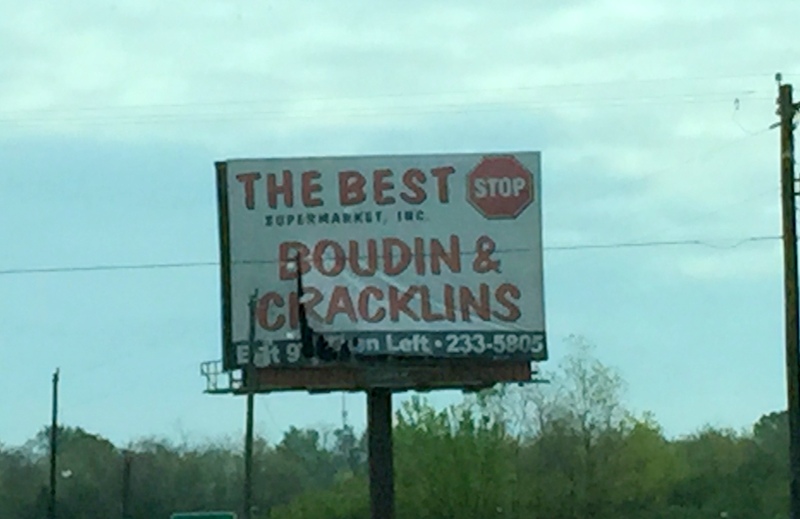 As we drive east on I-10 we noticed several signs boasting who makes the best Boudin & Cracklins. When we stopped at a fuel station for our late morning coffee break we had the opportunity to buy some warm cracklins, boudin, meat pies, and other deep-fried mysterious-to-us items. We chose a small serving of cracklins only out of curiosity. You know, eat like the locals. 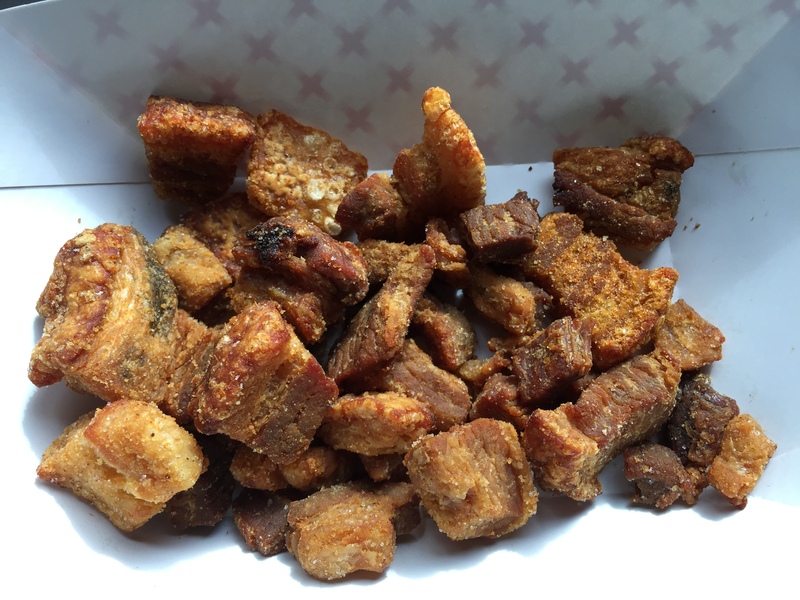 hmmmm… imagine deep-fried chunks of pork/fat/skin. Crunchy and rich, lightly salted. We couldn’t eat them all, and I didn’t even feel well after eating what I did. My Midwest milk-toast tummy can’t handle it. I knew better, really I did. 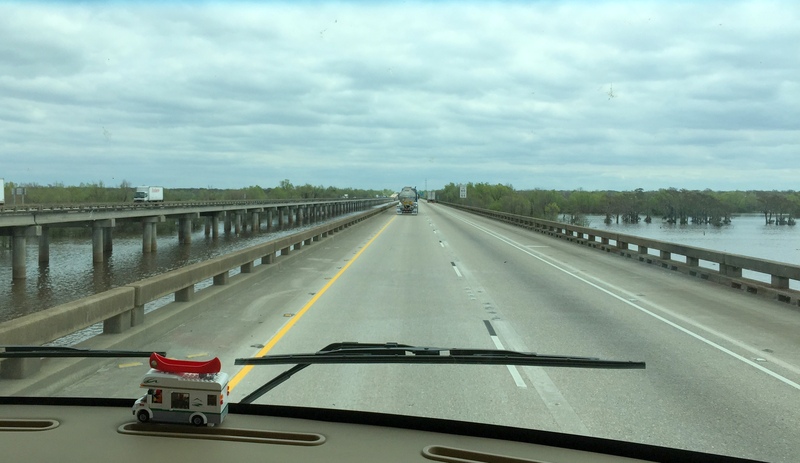 The Atchafalaya Basin Bridge, also known as the Louisiana Airborne Memorial Bridge, is the second longest bridge in the US and carries Interstate 10 over 18 miles of the Atchafalaya Basin, America’s largest river swamp. 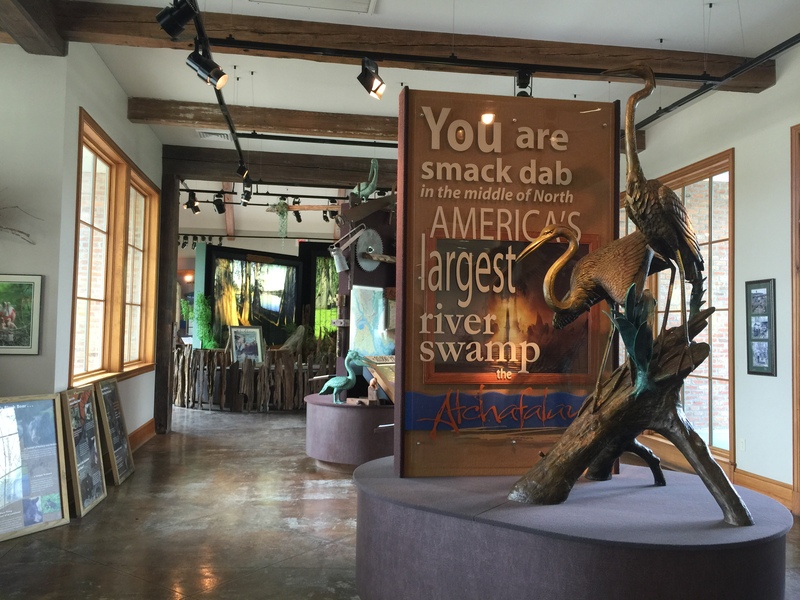 There is a cool visitor center with a large parking area towards the west end of the bridge. Tonight we are parked in a Walmart parking lot near Baton Rouge, Louisiana. Hopefully we can get some good sleep. 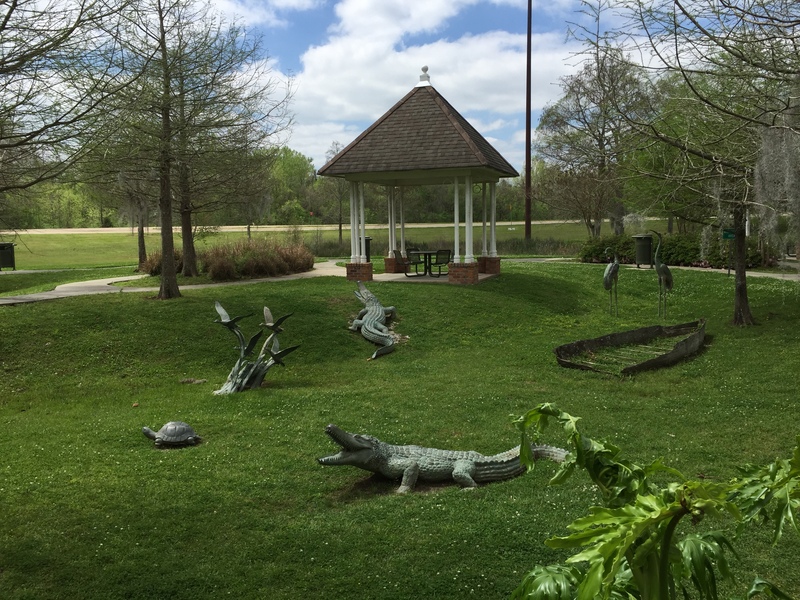 This entry was posted in Daily Post, Louisiana, March and tagged Atchafalaya, Bridges, Craklins, crawfish. Bookmark the permalink. We crossed those bridges going west a couple of weeks ago. Safe travels! As always, I love your blogs! Thanks for sharing!